MIRROR'S EDGE is a pretty special video game. Along with the hyper-real visuals and non-violent slant, the game has received much buzz in regards to its music. The first teaser trailer offered most their first glimpse into the red, white, yellow and cyan world of Faith, the free-running messenger. The sense of free-flight and awe that oozed out of the trailers was, in no small part, due to the music chosen to undergird the images. Savvy netters quickly found this mesmerizing chill-out track on Imeem entitled "Shine" by some enigmatic entity called ALCORUS. EA and Dice quickly denied that this was the song being used in the trailer and that it was a piece created by their chosen score composer (who turns out to be Magnus Birgersson/ Solar Fields). Well, despite the denial, aside from very minor differences, the two songs were a "mirror" of one another. Not long after, in response to all of the discussion board buzz over this music, EA and Dice released a few low-bitrate remixes of this new Mirror's Edge theme. Subsequent trailer releases would feature even more variations on this single theme; one of them introducing some intriguing, Imogen-Heap-like vocals. It was clear that there was some mass value to song that needed to be capitalized upon. 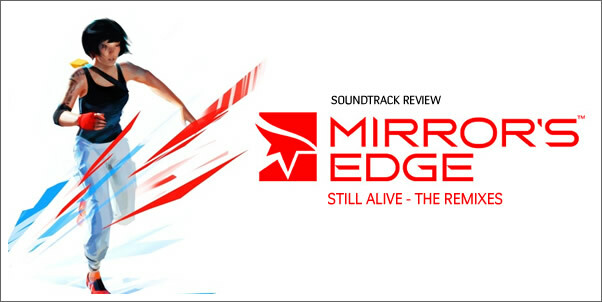 Shortly before the release of the MIRROR'S EDGE on Xbox 360, Playstation 3, and PC, EA announced there would be a release of the title track now entitled "Still Alive" with vocals by LISA MISKOVSKY. In addition to the straight, vocal version, the release would feature a number of remixes.